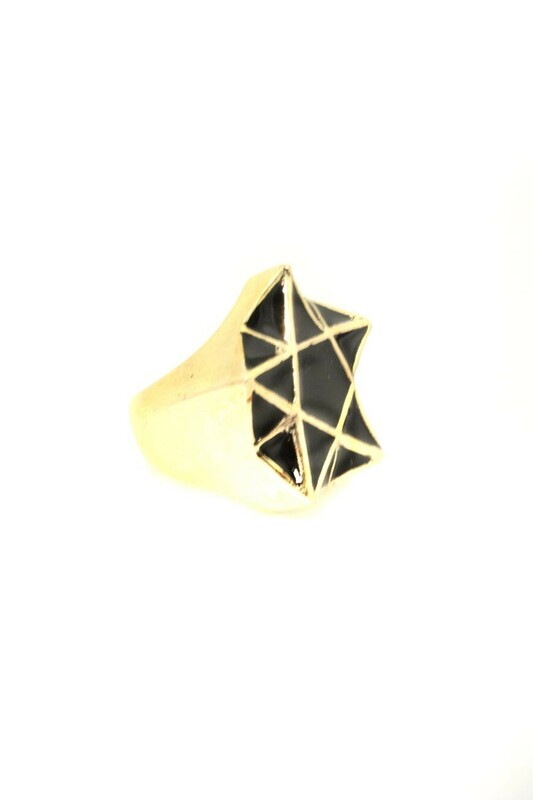 This vintage art deco style ring is brass with antique gold plating. It has a black pentagram design measuring 2cm. UK ring size N.
This 1920s style ring is brass with antique gold plating. It has a black enamel design with gold art deco detailing. UK ring size L.
This vintage style flapper headband is made from a gold tone metal. It has a swirling, vintage style design with a crystal embellishment. The art deco design measures 10cm by 5cm. This vintage inspired hairslide eatures an art deco design with clear diamantes on a plated gold comb. The design measures roughly 6.5cm. This is a flapper style party dress in cream with creamy golden beading in classic art deco design. The vintage style dress has a slightly pleated skirt, a drop waist, low v-neck and wide shoulder straps. Dry clean only.